A friend of mine reviewed this on her personal blog a while back and I thought it sounded like an intriguing read. A couple weeks later, I found this book on a bargain rack at a local bookstore. To me, that was a sign that I could not pass up and immediately bought the book!! :) My question for you is do you find the cover description as intriguing as I did? Two children disappear into the woods behind Woodside Elementary School. Hours later one of them, nine-year-old Adam, is found alive, the sole witness to his playmate's murder. But Adam is autistic and can say nothing about what he saw. Only his mother, Cara, has the power to penetrate his silence. When another child goes missing and Cara's unsettling past emerges from the shadows, she has to ask herself whether her efforts to protect her son have exposed him to unimaginable danger. 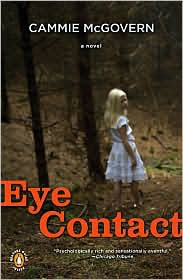 Eye Contact is a thriller of hypnotic suspense and a powerful story of the bond between a mother and a very special child. There are a few different stories out there these days featuring children with autism. This one I felt was a little bit different because the author has personal experience that is unparallel to any other that I have personally read: she is the mother to a child with autism. Throughout the book, the reader has the perspective of another mother's point of view, and I felt that it was more "real" to read than others that have attempted such an outlook. In addition to this unique perspective, the story has many other aspects that draw you in . . . discoverying the mystery of what exactly happened in the woods, bringing justice to the crime, and the twist of the mother's complicated past. It was a book that I had a hard time putting down! My initial thoughts of the book being an intriguing read was definitely what I got! Thanks for the great recommendation Jodie!! Eye Contact is one of the better books of all my recent reads!